Capitol Pools went the extra mile to help us make our pool vision a reality. We look forward to working with them in the future and will recommend them to others. Lois and I want to thank you and your team for the wonderful pool you installed for us. Now that it’s shut down for the season I’ve had time to reflect what a blessing it is for us and our family. It’s great grandson bait. They were here every few days doing cannonballs and shooting baskets. Those are memories that will last a lifetime, and we get to make more of them next summer! Lois and I commented many times during the construction process how meticulous you all were in getting things just right. Not just close to right…but exactly right. There were several stages of the installation process that were even more stout than I would have previously thought. 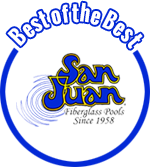 We’re confident that our pool and deck will be in shape to serve us and our family for many years to come, because you and your team cut no corners, but did every step to the highest quality. The process was problem free and enjoyable. And the end result was well worth the cost. Capitol Pools was willing to go the distance to make our backyard paradise a reality. Living over 2 hours away from the Capitol Pools headquarters, we were very pleased with the attention and service received before, during, and after our pool and spa construction. We always felt that our ideas for the project were heard and adjusted, when needed, to result in an outcome we would be happy with. We couldn’t be happier with Capitol Pools and recommend them highly to those considering a pool or spa addition in their back yard. Capitol Pools did a great job on our pool. They were knowledgeable, which made our decisions easier. They showed up when they said they would, worked hard, and completed the project when they said it would be done. We would recommend Capitol Pools to anyone looking for a positive experience and an awesome pool.